Greetings. I'm glad you dropped by. The first time I saw the above German Expressionist painting by Emil Nolde (1910), with its brilliant cyans, magentas, and goldenrods, its defiant angles and alien shapes, I was smitten. The Expressionists were not trying to capture their subjects as they looked, physically, but as they felt, emotionally or intuitively. From there, I discovered Dada, the Blue Rider, and New Objectivity. Each new wave of color and abstraction caught me up in a world where I wondered where and who I was. As a professor of German I spent the next 40 years studying films, paintings, woodcuts, and engravings of those movements. When I took up painting in retirement, I returned to that paradoxical world where I began. I have not tried to duplicate it, (“you can’t go home again,”) but I have struggled to paint with emotion, to slosh on clashing colors and lines, which lead in unpredictable directions, and which embrace an ironic view, nevertheless a sense of the subject's essence.. Even with work that seems more realistic, I cannot escape the oxymorons that bubble up from those early works of art. It has been a great trip. Eccles Community Art Center at Union Station, "Traces of the West," invited art works, July 2015. Eccles Community Art Center, Ogden, Utah, auction. Three pieces requested by the gallery, March 2015. Art Access, Salt Lake City, 12th Annual Fundraiser and Exhibition, "300 Plates, "May 12, 2014-June 6, 2014. 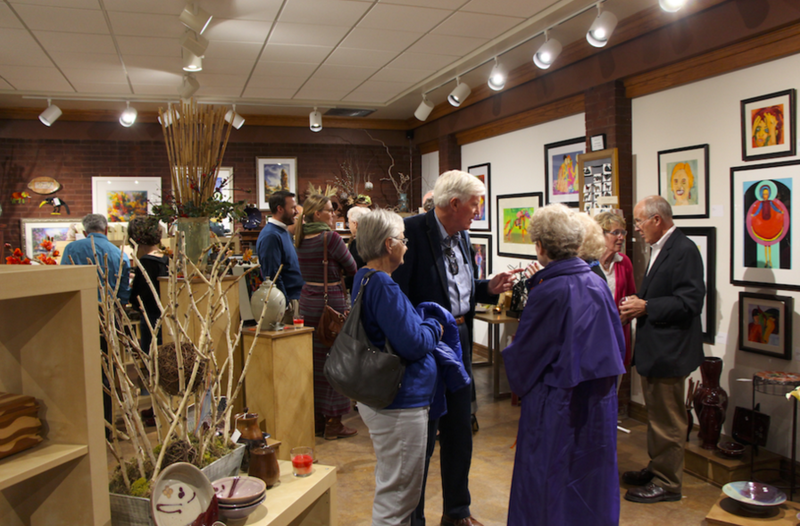 Bountiful/Davis Art Center, Farmington, Utah, statewide competition, March 7-April 4, 2014. Honorable mention for "Dawn." Eccles Community Art Center, Ogden, Utah, auction. Pieces requested by the gallery, March 2014. Eccles Community Art Center, Ogden, Utah, statewide competition, August-October 2013. Author and project director for “Germany in the Twenties: The Artist as Social Critic,” a series of interpretive exhibitions and events funded by the National Endowment for the Humanities ($500,000) which included five exhibitions, concerts, symposia and lectures, art, architecture, and design, dance, opera, and concerts. German Realism of the Twenties, Minneapolis Institute of Arts. Film and Politics in the Weimar Republic, University of Minnesota/Holmes and Meier. Germany in the Twenties, The Artist as Social Critic, U of Minnesota/Holmes and Meier. Grosz/Heartfield: The Artist as Social Critic, U of Minnesota. Don’t Bite Me, I’m Santa Claus, Salt Lake City, Shadow Mountain, 1999. Second Wind: Variations on a Theme of Growing Older. Salt Lake City, Shadow Mountain, 2000. Waltzing to a Different Strummer, Salt Lake City: Shadow Mountain, 2002.